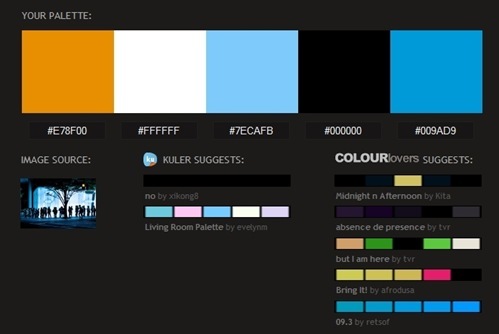 Ever wanted to create a color palette from an image? Or find what all colors fit best with an image while doing a project or assignment? Worry not, Pictaculous helps you find the best colors that suit the image your throw at it. Once you upload an image, Pictaculous displays a color palette rendered from the colors in the uploaded photo. In the photo above, you can see five palettes suggested for the photo uploaded (seen under image source). On the basis of the palette, Pictaculous also suggests similar color combinations/palettes from color theme sites Kuler and ColourLovers. Once the palette has been obtained, you can use the suggested colors in your design application or whatever thing you need it for. You can either copy the hash codes provided or download an Adobe Swatch File directly to your computer. Pictaculous also works on your phone where you can email photos to a provided address and get a reply with color codes.